The Columbia district included both the lower Columbia around Fort Vancouver, and the New Caledonia district around Fort St. James. 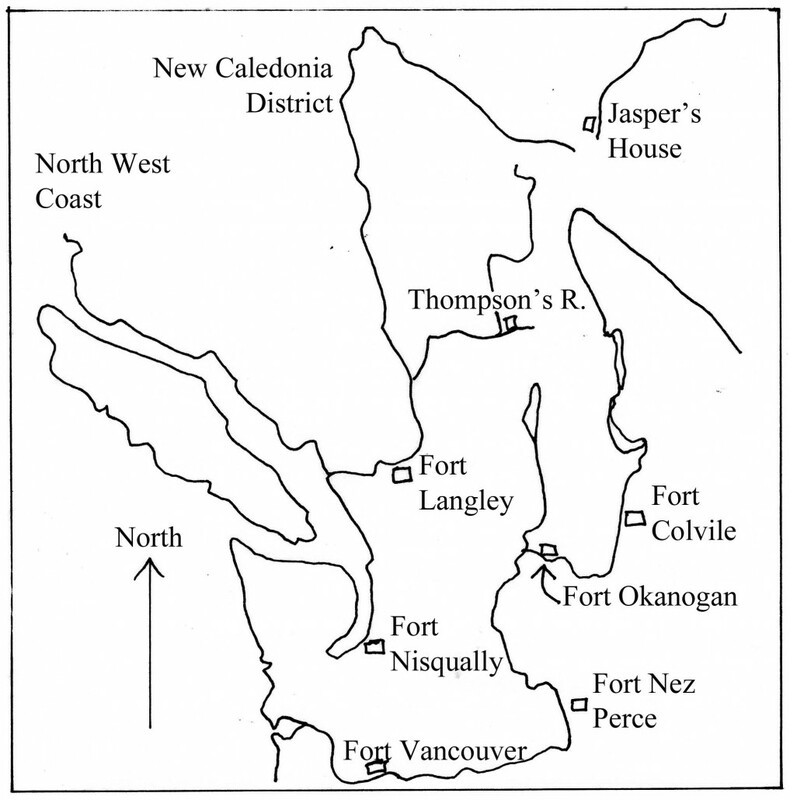 The incoming brigades traveled from Fort Vancouver to Fort Okanogan via the Columbia River, than by pack-horses via Kamloops, to Fort Alexandria, on the Fraser River. They would then load their goods into boats, and continue their journey up the Fraser River to Fort St. James — a thousand miles from Fort Vancouver! In 1826, Aemilius Simpson, who traveled with the incoming York Factory Express (called the Columbia Express), described Fort Okanogan. The man in charge of the place at the time Simpson visited it was Frances Ermatinger (Edward Ermatinger was at Fort Vancouver, as is proven by Frances’s letter to Edward in 1826). I find this story quite telling of the kind of character that Frances Ermatinger was. Tuesday 24th [October]… Below these rapids [in Nespelem Canyon] the River follows its course in a very Winding direction for about 3 1/2 Leagues, when you arrive at the Junction of the Okinagan River, where we arrived at 9 AM. We found Messrs Archibald McDonald, & Armtinga here; who presented a communication from Dr. McLoughlin, directing the Brigade to carry a Supply of Salmon, for Walla Walla, but as these fish have not yet arrived from Thompson’s River, we will be detained here till them. Wednesday 25th. A frost thro’ the night, followed by fine Weather during the day. Notwithstanding the apparent Sterility of this Spot, Mr. Armitinga has succeeded in rising Potatoes of an excellent quality, on a more fertile spot some distance from the Fort, on an elevated situation where the Soil possesses more moisture than on the lower ground. He has formed a Garden, also on the Bank of the Okinagan, immediately along side his establishment which produces such Culinary roots as he has had it in his power to try in considerable perfection, the pease came on rapidly & the Cabbages & turnips attained a large growth, their efforts are praiseworthy and adds much to the comforts of the individuals, as the Potatoes tend to render the Salmon, which forms the chief article of food a far more palatable and healthy diet. The Okinagan, the Indians that are about this post, appear pretty numerous, tho’ a poor looking people, and apparently very inoffensive, as the Weakness of the Post indicates, there being only a Clerk and one man in charge. The Salmon having arrived this evening, we will resume our Journey in the morning. [B.223/a/3, HBCA]. We reached Okanagan on the 10th Thursday [August 1826], where Mr. [James] Douglas had arrived five days before with the band of Horses all safe, tho’ many of them are too lean to proceed any further until they recover their Flesh. The Band of Horses I left there in the Spring are all recovered of their sores, and in good order, excepting some of those that are lately gelded, an operation it was necessary they should undergo to avoid the immensity of trouble they gave us in the spring, being again repeated. Gregoire the Horse Keeper has, with the assistance of Mr. Francis Ermatinger, repaired all the Horse appointments as well as his means permitted…. 15th Tuesday. At an early hour the Horses were caught & loaded without much trouble, and few of them seemed inclined to repeat the pranks of the two preceding days. We proceeded on for four Hours, when we stopped at the little chutes to refresh the Horses, after which we went on and encamped beyond the hill of the little chutes. [The brigades mounted the hills by McLoughlin’s Gulch]. The benefit we derived from allowing the Horses to rest daily on our way out was so eminent, that the same practice will be observed in our return. Washing their backs with cold water is also of much service to the poor Animals. This was begun to day and shall be continued… We made today about 22 Miles. I mean to go on quietly until the Horses are inured to fatigue, and sufficiently advanced in their Journey to ensure their being able to accomplish it without failing, for experience sufficiently teaches that when a Horse is once jaded, he cannot recover during the continuance of a voyage. 16th Wednesday. At four o’clock AM (the hour at which I am to commence every succeeding Days march) we proceeded from our Encampment, and passed two Rivulets one of which is distinguished by the name of Bonaparte, and at Eleven, reached the Bariere, or entrance of the Okanagan River, which we crossed by means of a Canoe we hired from a small party of Indians we found here. The Horses swam over and got safely across, excepting one which was unfortunately drowned. He happens luckily to have been one of the worst we had. Encamped for the Night at this place, where feeding for the Horses is abundant but the flies are numerous & annoy them much. Advanced to day about 18 miles. Our march was through a fine level Country, and the Horses being now rather fatigued go on quietly and in regular order. At first appearance of dawn the cry of “Leve, leve” is heard and with many a yawn and many a sigh we turn out and immediately all is bustle and whilst breakfast is being prepared the horses are rounded up and in an incredibly short space of time the tents are struck, packs loaded and the day’s march begins. In spite of the act that the horses are hobbled, it sometimes happens owing perhaps to scarcity of feed or an extraordinary pestilence of flies and mosquitoes, that they will wander far afield and before they can be rounded up, perhaps half a day is lost. The impatience of the gentlemen in charge under such circumstances can better be imagined than described; as he would glance every few minutes at this watch and impotently pace the camp ground probably thinking unutterable things. 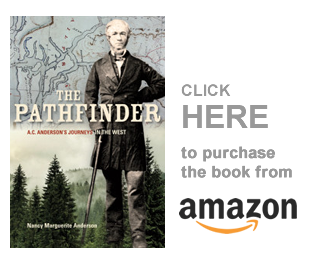 [Notes and Comments on Early Days and Events in British Columbia, Washington and Oregon, being the Memoirs of James Robert Anderson. Typescript, Copy in author’s possession but also found at B. C. Archives]. Tuesday 26 [July]. When the Brigades Consisting of 110 Loaded Horses, 10 each to 2 men with the Outfit, Provisions &c, left Okanagan, where some Pieces are left (Provisions) for want of Horses. C.T. [Sam] Black [now of Kamloops] having lent us 10. Being late before loading &c did not proceed far. Wednesday 27. Put up at the Tree along the River, rather early, one of the Horses having thrown his load some distance behind. There are 3 men for Kamloops with an Indian with their Brigade of Horses in Company, with 25 men of which 2 besides Gregoire have the Charge of the 6 Horses for Baggage for N.C. [New Caledonia] District form a long line. Thursday 28. Put up for the night at Farthest Riviere a Bonaparte. 29. Baited the horses at the Forks where Exchanged a worn out Mare for a horse with one of the Natives from the camp we found at this Place. Traded some salmon & berries and proceeded to Tea River where we put up for the night. “The Forks” mentioned by Dease is the Forks of the Similkameen River where it flows into the Okanogan River just south of Osoyoos Lake. — at Oroville, WA, in fact. The river north of Osoyoos Lake maintains the same name it had to the south, but with its Canadian spelling : Okanagan River. Tea River is modern day Testalinden Creek, that flows into the Okanagan River just north of Osoyoos Lake. Both brigades are in more or less the same place, and so in my next post we can continue the journey north along the Okanagan River. It will take a few more posts before we arrive at the Kamloops post, I believe — and remember, we are going all the way north and west to Fort St. James, on Stuart’s Lake. We have a long way to go, but the journey is amazingly quick. They will be at Fort St. James in mid-September, if all goes well!